After a refreshing and very late lunch at the café next to the Musée D'Orsay, we walked all the way back along the closed road on the left bank, reaching the Champ de Mars just at the time the Day of the Pedestrian and Cyclist was ending. 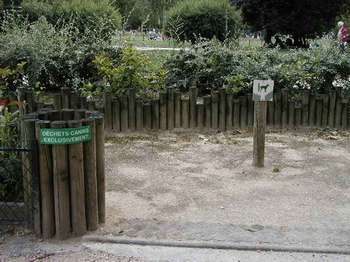 The Champ de Mars, by the way, is the site of dog owner training sessions -- part of a major ongoing effort to get Parisians to pick up after their dogs. Here in the Champ is a special place set aside for doggies to do their business. We don't show pictures of the apartment because we protect the owners' privacy. But here is the view out the back -- kitchen window. 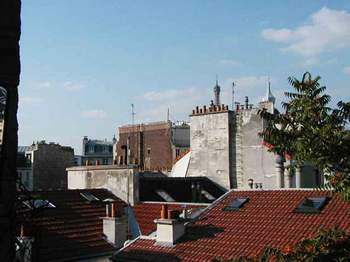 See the top of the Eiffel Tower? And from the study. 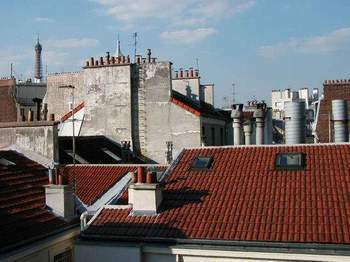 It is a lovely, quaint Parisian rooftop scene. And we have nice parks nearby. This one is very close -- Square Saint Lambert. It has a nice, big water fountain in a little lake, but it was mostly in shadow at this time of day. Out in the sun, people are still sunbathing and a juggler is practicing his art. 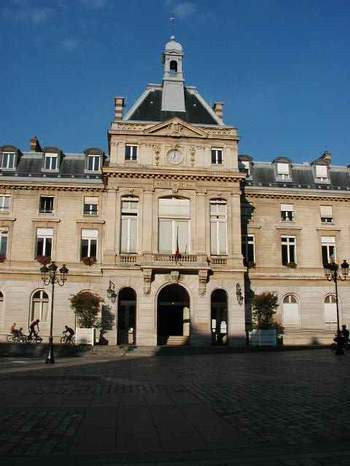 Nearby is the Mairie (town hall) for the 15th arrondisement. This is a recent discovery for us. There is a huge cobblestoned place out in front. Cyclists are practicing their stunts there. 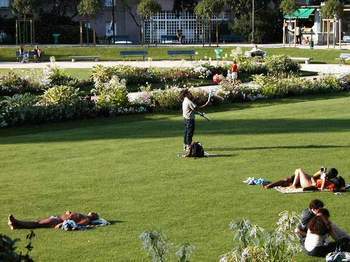 Nearby is a lovely park with chestnut trees and a children's play area, and there are some cafés with very large terraces on the square as well. 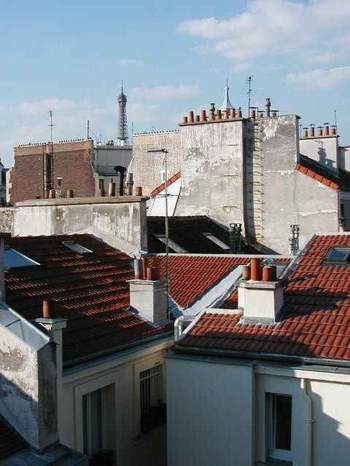 This ordinary street life, the liveability of the city, is the best aspect of Paris.